VAIR Field – CENOTE Inc.
VAIR is a mobile virtual reality (VR) system that enables multiple people to play VR or AR games at the same time. Many head-mounted displays (HMDs) for consumers have been developed, but HMD users can experience problems including VR sickness or a feeling of discomfort. HMDs also have minimum age requirements. 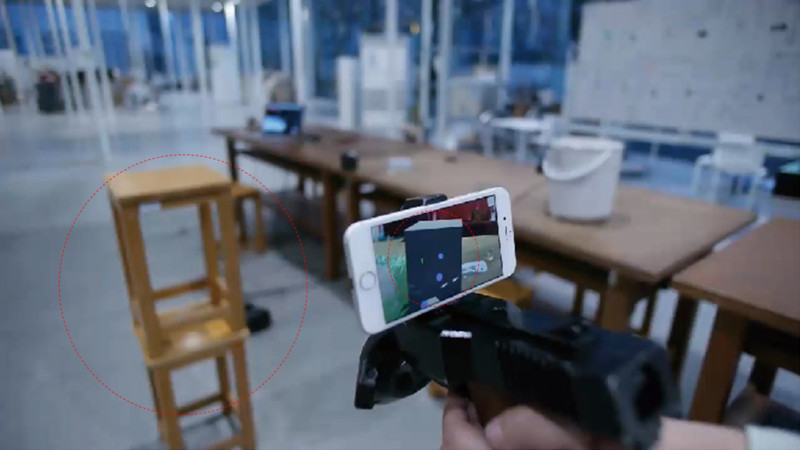 By combining any smartphone operating system (iOS, Android OS) with a positional tracking sensor (HTC VIVE Controller), VAIR can enable anyone to play room-scale VR or AR games in a 360-degree all-around view without a HMD. Players can freely combine these devices. Up to 15 devices can be used. 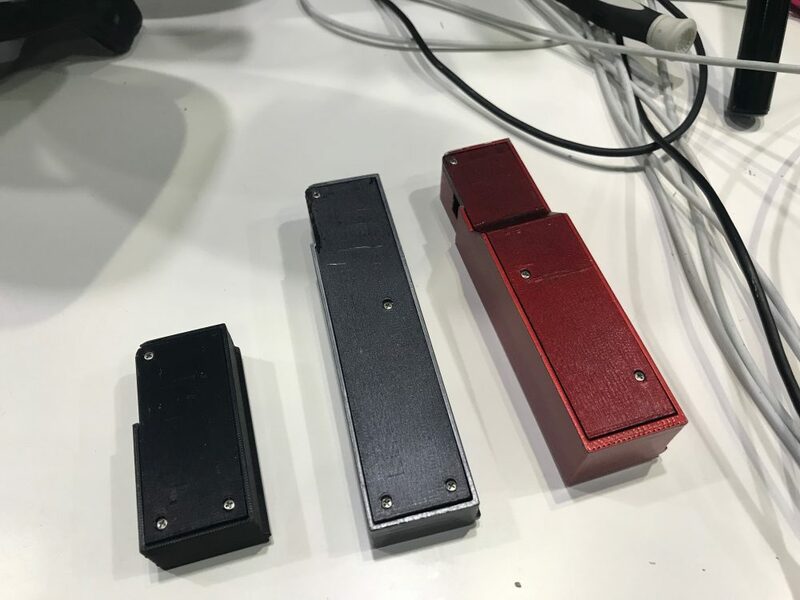 There are two kinds of gun type VAIR devices.Latest one using vive tracker, old one using vive controller. 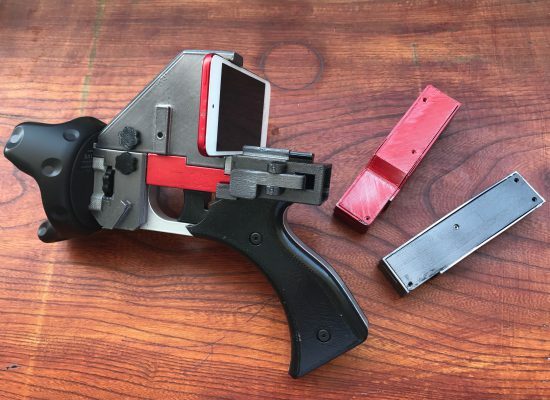 The latest gun-type VAIR device is designed to replace magazines and it is necessary to actually change magazines when reloading.The system automatically recognizes which magazine is installed, not only manages the number of bullets remaining for each magazine, but also the recoil mechanism when shooting, respectively.Also not only will bullets shoot accordingly change, but also the viewing angle of the picture will change as well.For example, if equipped with a sniper rifle magazine, the viewing angle of the image of the smartphone at hand will be narrowed and zoomed.The recoil and sound when shooting will also increase. VAIR has a Windows machine as a server, and there are up to 15 VAIR devices there. 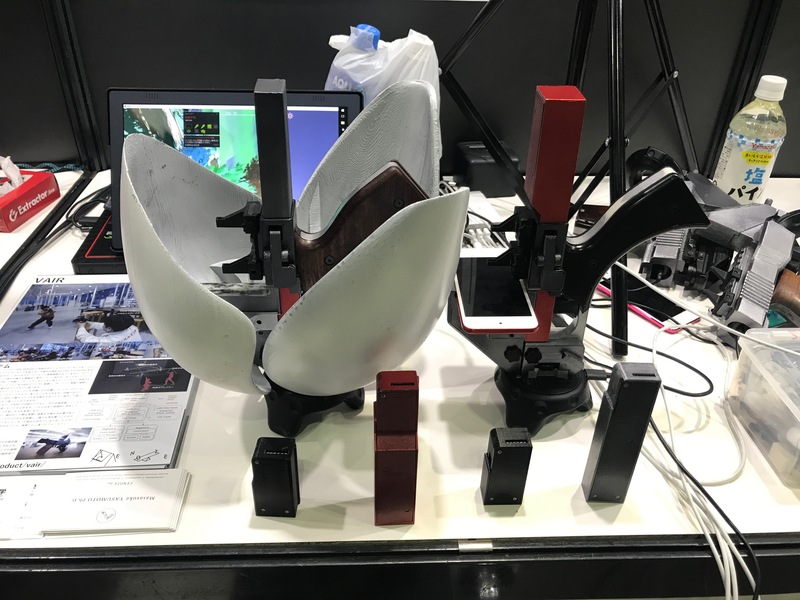 The VAIR device is equipped with a smartphone (use itself is possible without mounting it), and the VR space seen from there is displayed. 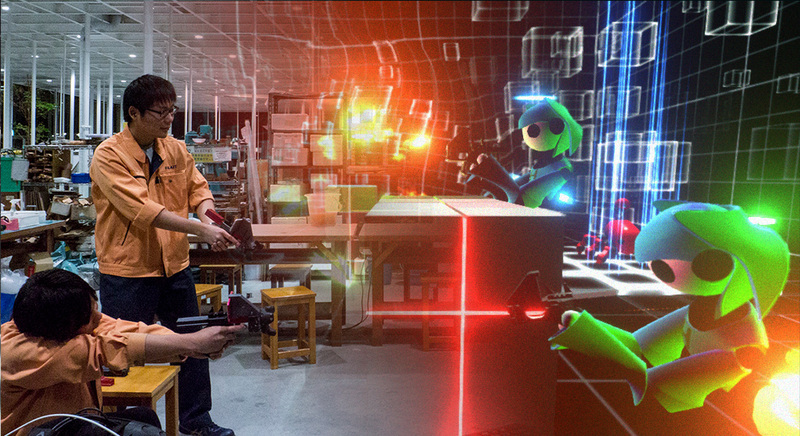 The VR space is shared by all devices, and each other can recognize each other's place, it is possible for two or more people to cooperate and play against each other. VAIR requires a smartphone and a positional tracking sensor. 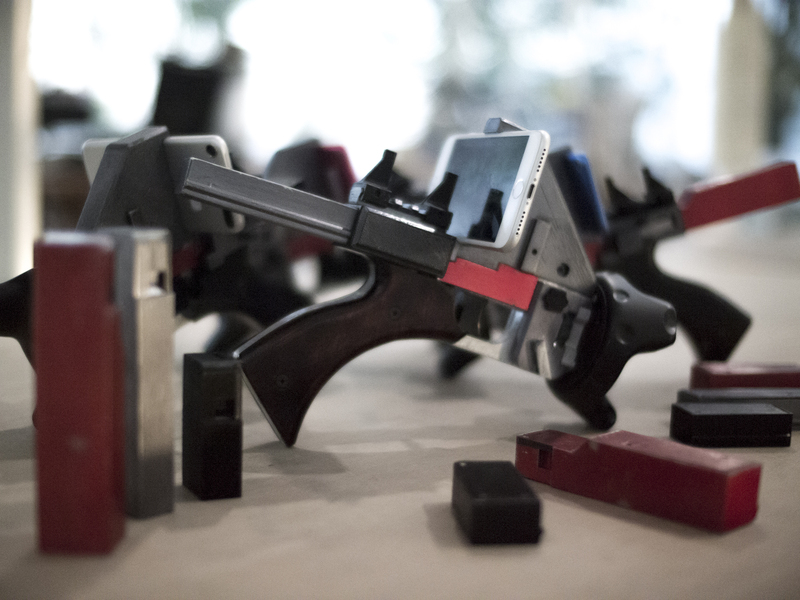 The most accurate sensor we use is a HTC VIVE Controller combined with gun-shaped attachments of aluminum alloy and wood. 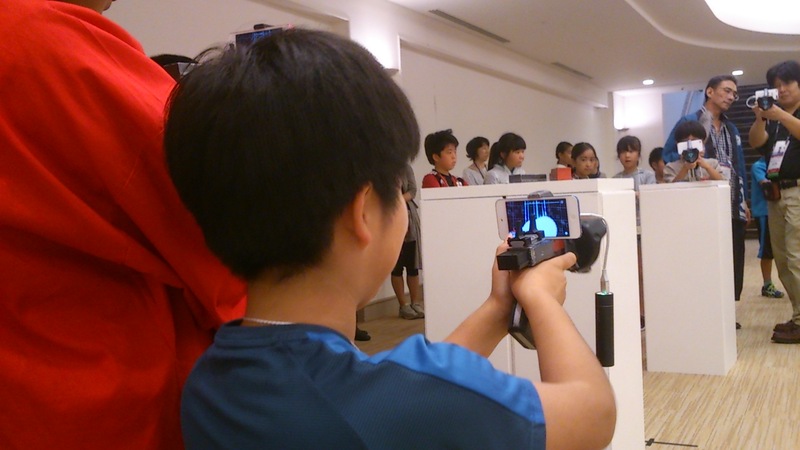 By changing the upper attachment, VAIR can use any smartphone. In the mobile VR that VAIR provides, a player sees not only a VR space but also a real space. 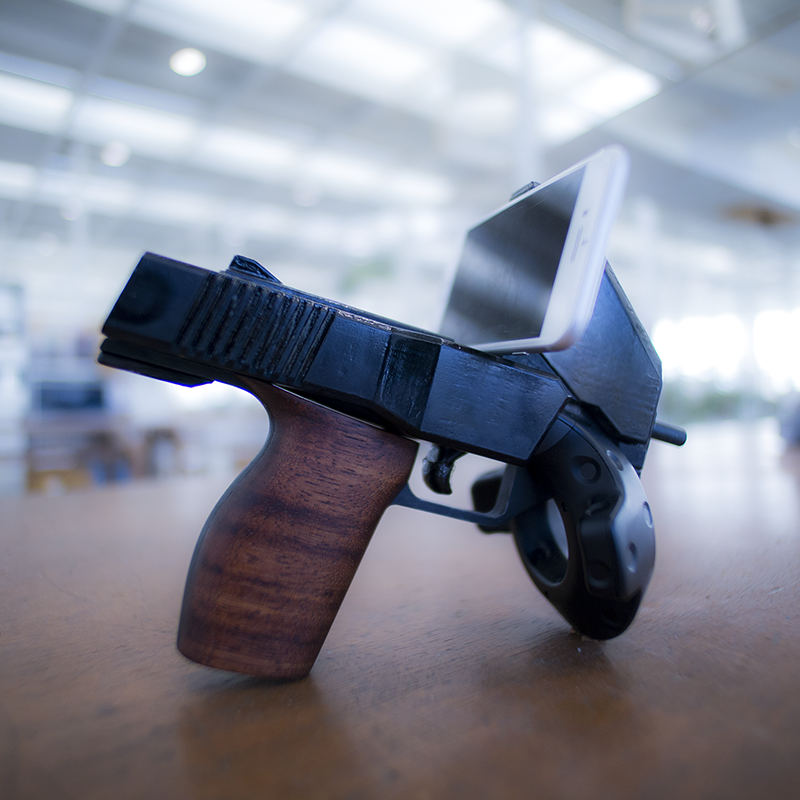 Because the feel and appearance of the controller are important, VAIR imitates the real shape and texture of a hand gun. 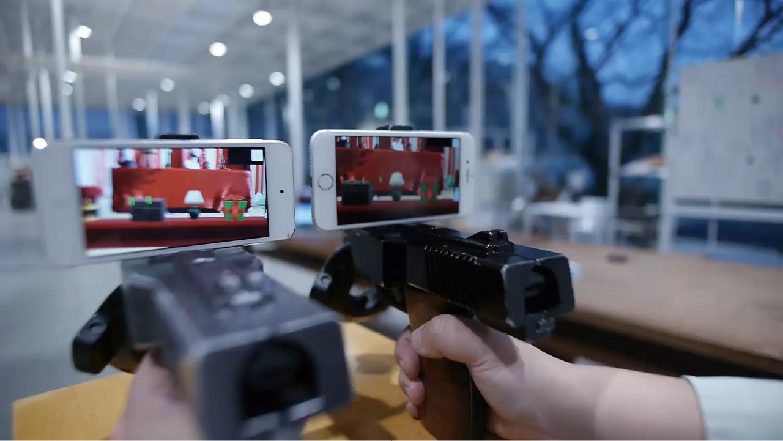 When the player pulls its trigger, he or she can shoot a virtual bullet in any direction in a virtual space. 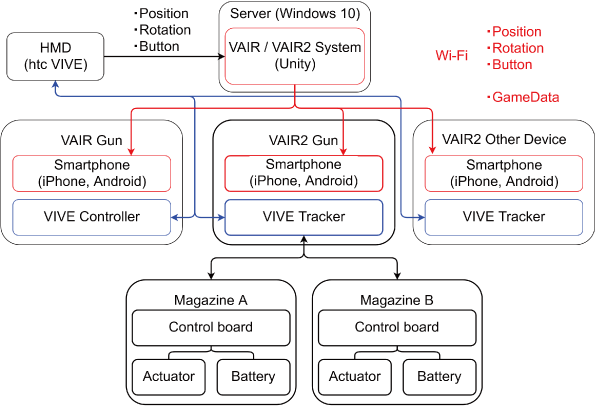 VAIR corresponds to multiple controllers and shares VR space, so it recognizes bullets shot by all controllers. 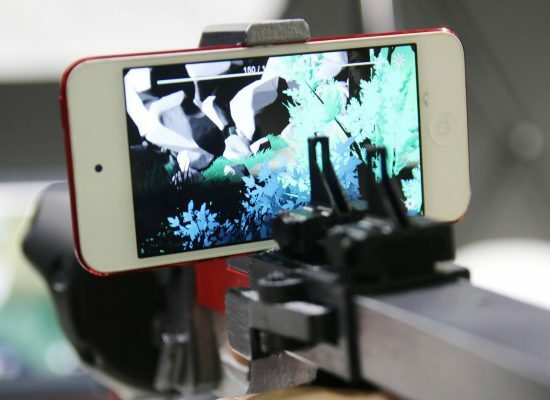 Therefore, VAIR provides various playing modes; for example, a player can play alone with two guns, cooperatively with more people, or against them. Moreover, by inputting data of a real object’s position and scale to the VAIR, the object can be used as an obstacle in VR space. 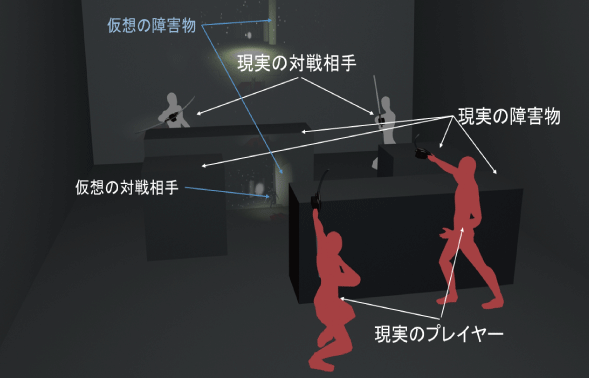 When a player hides behind the object, he or she can hide behind the obstacle in VR space and can play in a gun fight using realistic tactics. Since the real space is clearly visible in the mobile VR, a player can safely run around, which is impossible with a HMD. Therefore, the VAIR will enable players to move in a sports-like way more freely than VR using a HMD. 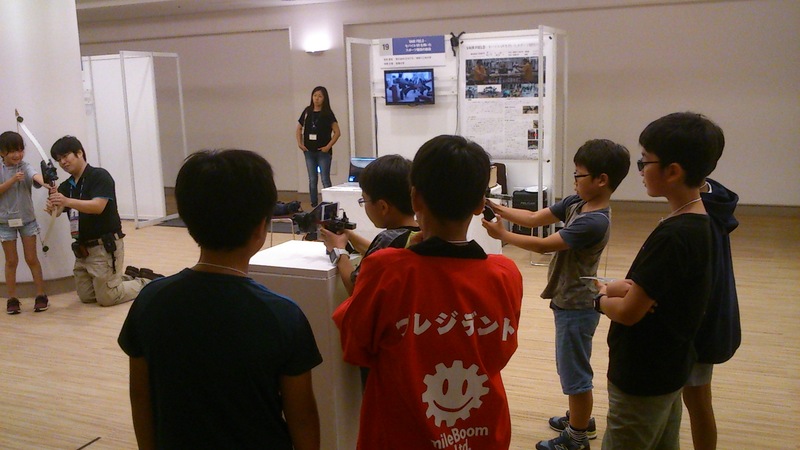 We call VAIR using the HTC VIVE “VAIR 1”, which is very simple. VAIR 1 connects a HMD to the server PC (even though this HMD does not have to be used) and registers paring information of the controller and its above smartphone. The server transmits information such as the controller’s position, angle, and trigger to the smartphone. The server and the controller communicate only their coordinate information, so the communication load is small. All the images are rendered on the smartphone. 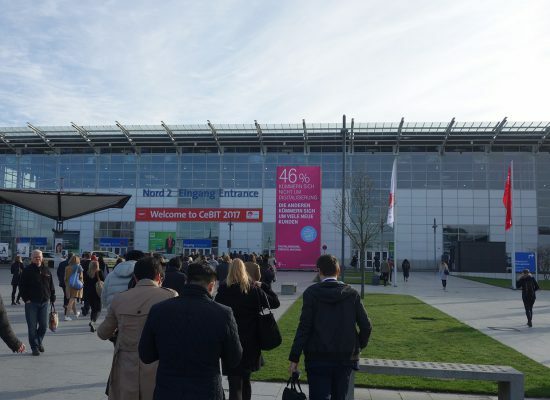 VAIR can play up to 15 people at a time per system. 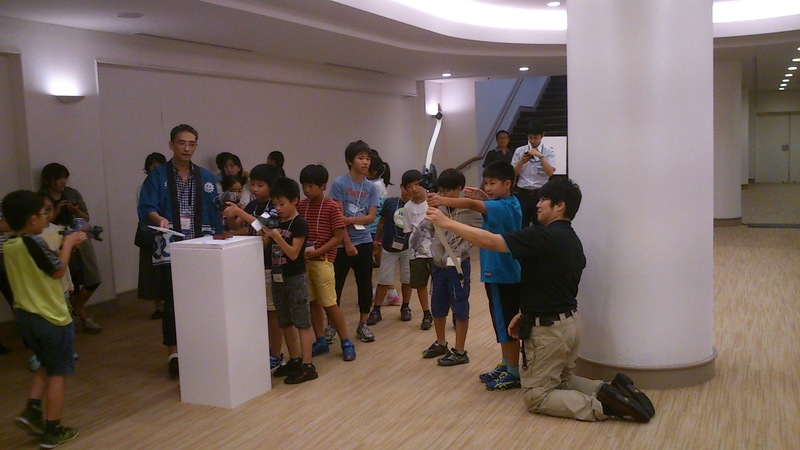 It is a battle divided into teams, but you can also fight with NPC in cooperation. If there are bias in the number of teams, adding NPC can adjust the number of people, even if there are actually only 4 people to 4 people, 100 NPCs can be added to realize how to play like big battle. In the future, by linking multiple systems over the network, you will be able to realize team warfare between remote spaces. VAIR recognizes the location of all devices and shares space. Therefore, if you point the VAIR device to the place where other player is located, the avatar of other player will be displayed at the same position on the display of the smartphone. By doing this, it becomes possible to play with playing aiming at the real opponent like an actual FPS. It also seems as if you are playing network games FPS with real places because you also share the positions of bullets and obstacles that you shooted with each other. In VAIR, obstacles that exist in reality, such as chairs, desks, blocks, etc. can be registered as obstacles in VAIR. By hiding in the shadow of the actual obstacle by this, it becomes hidden similarly in the virtual, it can prevent the enemy's attack and gaze. 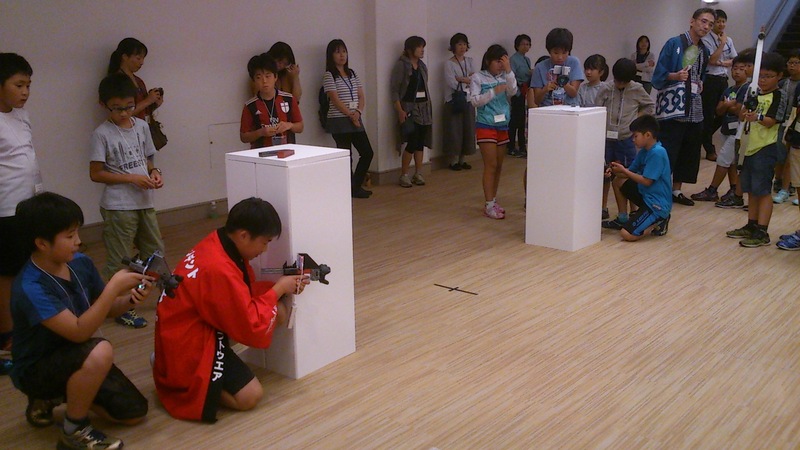 By placing obstacles freely in the room and registering them, you will be able to play in different fields every time. In the figure on the right we register obstacles for the chair, so it is displayed on the smartphone at the same position as a block. 1. Masasuke Yasumoto, Takehiro Teraoka. 2016. Second Prize. Mashup Awards 2016. Tokyo Japan.